Railway Recruitment Board ALP, Technician posts (26502) Recruitment 2018, How to Apply? #RRB notification for ALP and Technician 2018, Steps on how to apply, eligibility, etc. RRB Recruitment 2018: Apply for 26,502 ALP, Technician: Railway Recruitment Board, RRB has released the official notification for the recruitment of Assistant Loco Pilot and Technicians in Indian Railways. The notification as released on March 3, 2018, on the official website of all regional RRBs. Interested candidates can check the detailed notification, important dates, eligibility and vacancy table on the link provided below. Summary of the vacancy is also provided. Tentatively, Indian Railways would be hiring about 26,502 assistant loco pilots and technicians through recruitment exercise CEN 01/2018. Railway Recruitment Boards Employment Notification 2018 details. (iii) eligible candidates whose scheduling has not yet been released is now fixed on 4th September 2018. SMS and email have been sent to all the above candidates to view their exam city, date and shift. E call letter shall be available for download from 31st August 2018. All the candidates whose examination was cancelled on 9th August 2018 can avail the facility of free travel, authority for which shall be available for download along with the exam city, date and shift intimation.
" RRBs have notified 26,502 vacancies for the posts of Assistant Loco Pilot (ALP) and Technicians. In terms of Para 7 of CEN under the head “Important Instructions”, the above vacancies were provisional. These 26,502 vacancies are likely to be increased to about 60,000 vacancies. Post wise details of enhanced vacancies will be advised on the official websites of RRBs in due course. Candidates are requested to visit the official websites of RRBs regularly for updates." Railway Recruitment Board, RRB has released a notification informing of its decision to increase the total number of vacancies in RRB ALP & Technician 2018 recruitment. Notification related to RRB Recruitment 2018 under CEN 01/2018 for ALP & Technician, the first stage CBT of which begin from August 9, 2018. As per the notice released last night on rrbmumbai.gov.in, the RRB ALP & Technician 2018 recruitment is likely to be increased from 26,502 to 60,000 vacancies. The revised vacancies would be updated on the regional websites of various RRBs in due course of time. In the meanwhile, RRBs have released the exam time and date for the candidates who have applied for RRB ALP & Technician recruitment 2018. As many as 47 lakh candidates have reportedly applied for the examination. The First Stage CBT for the recruitment would commence from August 9, 2018. RRB ALP Admit Card download would begin on the regional websites from August 5, 2018. Candidates are advised to note that with the change in the number of vacancies, it is likely that RRBs open the applications again for changes in preferences. This, however, is likely to be done after the first stage CBT is over. Also, with an increase in number of vacancies, the number of candidates who would be shortlisted also increases considerably. As per the past trends, RRBs usually shortlist about 10 times the number of vacancies for the subsequent rounds. The exact number is not shared by the RRBs. However, as per experts, RRB is likely to conduct more than one level of written tests. The first level or first stage CBT would commence from August 9. Railway Recruitment Board (RRB) has announced the examination schedule for the first stage examination for Assistant Loco Pilot and Technician posts. The candidates who are waiting for updates may note that the board will conduct the exam on August 9, 2018. The exam will be a computer-based test (CBT) and the link for the mock test will be activated on July 26, 2018. How to download RRB ALP Admit Card for 20th August 2018 exam? The selection of the candidates will be done on the basis of 1st stage CBT, 2nd stage CBT, Computer Based Aptitude Test and Document Verification. The 1st stage Computer based Test (CBT) is an objective type test that comprises of 75 questions and candidates are given 60 minutes to attempt the same. It must be noted that there will be a negative marking for incorrect answers in 1st and 2nd Stage CBT. Candidates may login with their credentials on the above mentioned dates through the link to be provided on the official websites of RRBs for knowing their Exam City, Date and Session and downloading Travel Authority (for SC/ST candidates only) and E-Call letter. The CBT will be of 60 minutes and will carry a total of 75 questions. The questions will be from Mathematics, General Intelligence and Reasoning, General Science, and General awareness on current affairs. Advertised in February, this recruitment drive was open for candidates who have passed class 10th and ITI or diploma in engineering or a graduation in engineering. Two separate notifications, CEN 01/2018 and CEN 02/2018, were released by the RRBs for recruitment to 90,000 Assistant Loco Pilot, Technician and Group D posts. As per the latest data given by the Ministry of Railways, for a single seat, one candidate shall have to compete with 279 other candidates. More than 25 million people have applied for the posts. Railway Recruitment Board (RRB) has released the section-wise marks distribution for the first stage computer based test for the recruitment of ALP and Technician. The exam will begin on August 9, 2018. The test will comprise 4 sections and will be of one hour duration. The total number of questions in the test will be 75. The four sections in the question paper will be Mathematics, General Intelligence and Reasoning, General Science, and General Awareness and Current Affairs. There will be 20 questions in mathematics section, 25 questions in General Intelligence and Reasoning, 20 questions in General Science, and 10 questions in the General Awareness and Current Affairs section. The official notification released by RRB however also mentions that the section-wise distribution is only indicative in nature and there might be some variations in the actual question paper. RRB is also expected to release mock test link today on its official website and regional RRB websites. The mock test would help candidates to understand the exam pattern and modalities of the exam in a better manner. RRB will also release the exam city, date and session for the registered candidates soon and will release the respective admit cards 4 days before the exam. Railway Recruitment Board has released the exam city, date and session details for the candidates who have applied for the recruitment process of ALP and Technicians post with the Indian Railways. Candidates can access the same from the Regional RRB website to which they have applied for recruitment. RRB has only released the exam city and exam day details and the exam centre address will be released with the admit card only. Candidates can go to the Regional RRB website and click on the link provided for City and Date intimation and SC/ST Travel pass. Upon clicking on the link, candidate will be redirected to a new window where they will have to login. Upon login, the candidate will be able to see their exam city and exam day and session details. Railway Recruitment Board (RRB) invites applications for the recruitment of Assistant Loco Pilot, Technician vacancies in different Railway Recruitment Boards (RRBs). 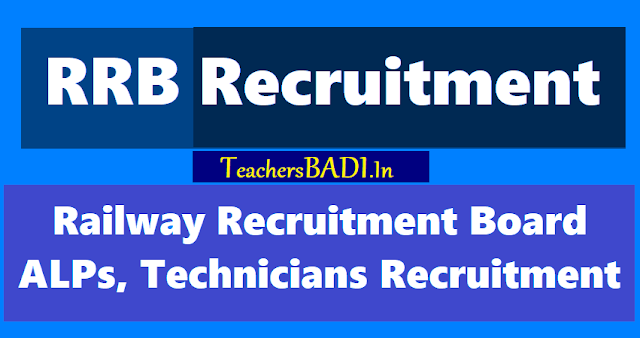 READ : RRB ALPs, Technicians Recruitment - How To Apply? 1. Last date of online application for ALP and Technician posts revised from March 5, 2018, to March 31, 2018. 2. Age Limit for applying for the said posts has been extended. The new age limit for CEN 01/2018 recruitment examination now stands from 18 – 30 years. Accordingly, the new upper age limit for various categories are summed below along with the cut off date of birth. Age Limit: 18 to 30 years as on 01.07.2018. Qualification: Matriculation/ SSLC. ITI in the trades of Armature and Coil Winder/ Electrician/ Electronics Mechanic/ Fitter/ Heat Engine/ Instrument Mechanic/ Machinist/ Mechanic Diesel/ Mechanic Motor Vehicle/ Millwright Maintenance Mechanic/ Mechanic Radio & TV/ Refrigeration and Air-conditioning Mechanic/ Tractor Mechanic/ Turner/ Wireman or Diploma in Mechanical/ Electrical/ Electronics/ Automobile Engineering. Or 10+2 with Physics and Maths. Selection: Based on Common Computer Based Test (CBT), Aptitude Test and Document Verification. Last date to apply online: 05.03.2018. Candidates are advised to note that the vacancy table provided in the detailed notification is tentative at present. The final details of the vacancy would be provided on the RRB website before the 1 stage CBT. Candidates would have to appear for a common Computer Based Test for both ALP and Technician posts. The Ist Stage CBT is tentatively scheduled for the month of April/ May. Candidates who qualify and have applied for ALP would be called for the Second Stage CBT examination. The details of the examination would be notified in due course of time. Candidates interested are required to apply only on the official website of Railway Recruitment Board. The direct link to the application for CEN 01/2018 is also provided here. Before filling the form, all candidates are advised to carefully go through the detailed notification (link provided above). Candidates found not matching the eligibility criteria would be disqualified. Step by Step instruction on how to apply is provided below for your convenience. A new window would open and click on the New Registration Button at the bottom of the page for candidates who have not registered yet. For users who have already registered, please click on Already registered. Provide basic and persoal details as asked in the form which include name, father/ mother's name, date of birth, email id, mobile number, aadhaar number, etc. The system would then prompt you to make the payment of Rs. 250. Please note, you can make payments online or through SBI/ Post Office Challan. The important dates for payment of fees by all the methods are provided above. You would be allowed to fill other information only after payment of fees, hence complete the application form and click final Submit. All candidates interested in applying are advised to note that they would be allowed to make changes only twice. Hence it is important that they go through the detailed notification and fill the form carefully. The Online application form for Railway Recruitment of ALP and Technician posts 2018 close on March 5, 2018.